Citation: Liu, Jun, et al. Domain-Specific Hyponym Relations LDC2014T07. Web Download. Philadelphia: Linguistic Data Consortium, 2014. Domain-Specific Hyponym Relations was developed by the Shaanxi Province Key Laboratory of Satellite and Terrestrial Network Technology at Xi'an Jiaotung University, Xi'an, Shaanxi, China. It provides more than 5,000 English hyponym relations in five domains including data mining, computer networks, data structures, Euclidean geometry and microbiology. 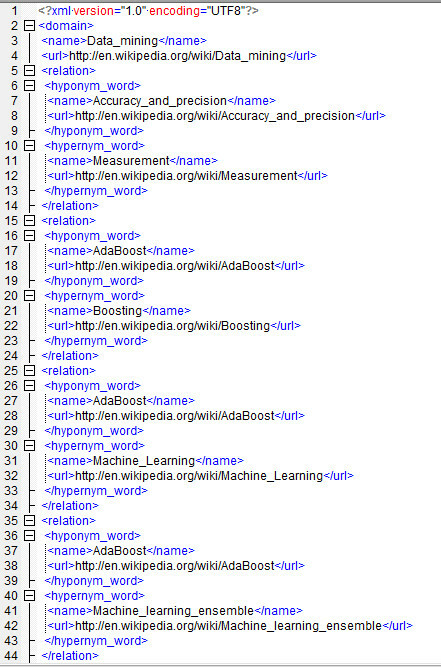 All hypernym and hyponym words were taken from Wikipedia article titles. A hyponym relation is a word sense relation that is an IS-A relation. For example, dog is a hyponym of animal and binary tree is a hyponym of tree structure. Among the applications for domain-specific hyponym relations are taxonomy and ontology learning, query result organization in a faceted search and knowledge organization and automated reasoning in knowledge-rich applications.